"Family violence includes not only physical injury but direct or indirect threats, sexual assault, emotional and psychological torment, economic control, damage to property, social isolation and any behaviour which causes a person to live in fear" (Department of Human Services 2016). Statistics on recorded family violence incidents are likely to significantly underestimate the magnitude of the problem. A recent survey conducted by the Australian Bureau of Statistics revealed that police were contacted in relation to 17% of current partner violence instances and 25% to 35% of instances of violence perpetrated by a previous partner (depending on the gender of the victim). The increase in recorded family violence incidents shown in Figure 6 does not necessarily mean that family violence incidents have increased. Enhanced reporting by police and greater confidence among victims that they will receive assistance from police are likely to account for much of the increase in recorded incidents (Royal Commission into Family Violence 2016). Figure 1 shows recorded police call outs for family violence incidents represented as a rate per 100,000 population for City of Boroondara and Victoria from 2000-01 to 2016-17. 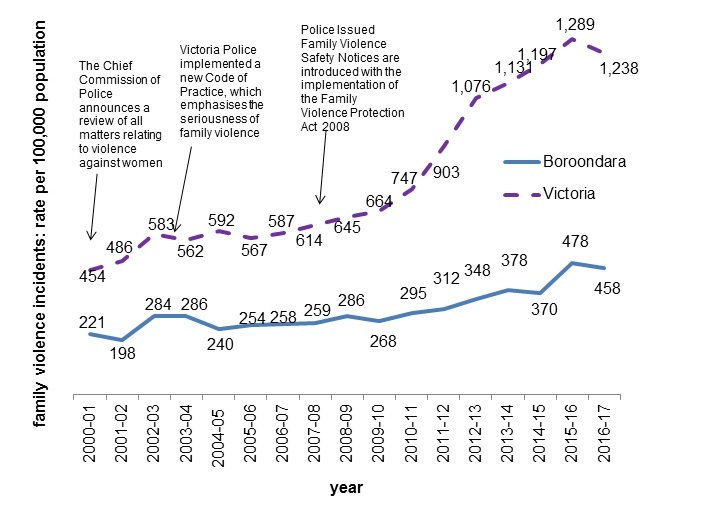 The chart shows a steady upward trend across Victoria and Boroondara in the rate of family violence incidents reported from 2000-01, when the Chief Commission of Police announced a review of all matters relating to violence against women, and followed by Victoria Police implementing a new Code of Practice, emphasising the seriousness of family violence in 2003-04. Figure 1 continues to show a steep increase in the rates of family violence reports per 100,000 residents across Victoria, after Police Issued Family Violence Safety Notices were introduced with the implementation of the Family Violence Protection Act 2008, in 2008-09. The City of Boroondara continued to show a steady upward trend in family violence incidents from 2008-09, with a large increase in family violence reports between 2011-12 and 2012-13, from where rates have not dropped. According to the Crime Statistics Agency, 75% (57,171) of the 76,503 family members affected by family violence in Victoria in the last 12 months were female, while 25% (19,043) were male. 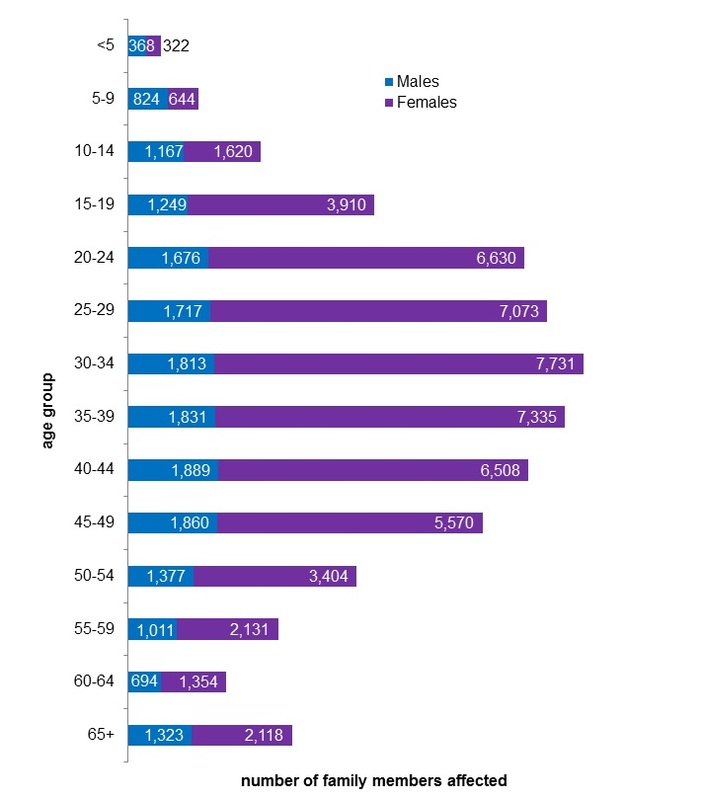 Figure 2 shows the recorded number of family members affected by family violence by age and gender in Victoria for year ending June 2017. It shows that female family members were significantly more vulnerable than men, with women between 20 to 44 years of age being the most prevalent cohort of family members affected by domestic violence.